Printable Hanukkah coloring pages, math worksheets, writing prompts, activities, and more. 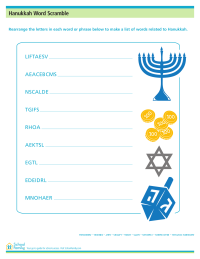 Hanukkah-theme word scramble will challenge and entertain kids while reinforcing family traditions. Answer key is provided at the bottom. 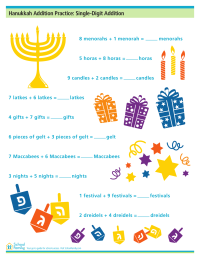 Use this Hanukkah-theme worksheet to reinforce both simple math concepts and family traditions. See how many Hanukkah words you can find in this word search from the list at the bottom. 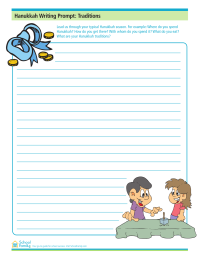 Use this Hanukkah writing prompt to help children practice their writing skills while discussing their family's Hanukkah traditions. 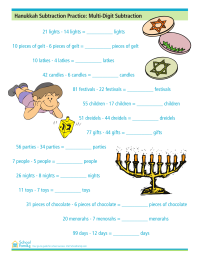 Practice multi-digit subtraction with this Hanukkah-themed math worksheet.